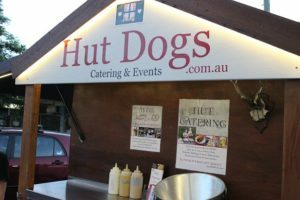 Our brand Hut Dogs™ stands for premium quality Hot Dogs catering or all occasions and virtually any location (indoors and outdoors). We cater for private and corporate events, lunches and dinners, after work drinks, anniversaries, birthday parties, sales events (e.g. end of financial year sales), store-, facility-, warehouse-openings, promotional activities, brand activations, weddings, funerals and many others. We also specialize in special events such as Oktoberfest, Bierfest, Winterfest, Christmas markets, school fetes, Karneval, Eurovision song contest parties, Australia Day, Melbourne Cup, Bucks nights, Hens nights, Christmas in July, Apres ski parties and many others. We are open for any new ideas and happy to customize our food and beverage offer to suit your special event. Hot Dogs are perfect for private events such as birthday parties, weddings, christenings, anniversaries and many more occasions. They are also ideal for many types of corporate functions such as after work drinks, store openings, Oktoberfest, staff parties and much more. The German Hut is a specialist for rustic to modern German inspired events with catering, mobile bar services and complete event management solutions including entertainment, event styling, hire equipment, event conception and more. We serve the following events: Private and corporate breakfasts, lunches and dinners, after work drinks, anniversaries, birthday parties, sales events (e.g. end of financial year sales), store-, facility-, warehouse-openings, promotional activities, brand activations, weddings, funerals and many others. We also specialize in special events such as Oktoberfest, Bierfest, Winterfest, Christmas markets, school fetes, Karneval, Eurovision song contest parties, Australia Day, Melbourne Cup, Bucks nights, Hens nights, Christmas in July, Apres ski parties and many others. We are open for any new ideas and happy to customize your theme with full sales and marketing integration possible. Our catering includes Gourmet Hot Dogs with delicious German sausages, German BBQ buffets and some delicious and unique German finger food creations. We also offer a great range of gluten-free, vegan and vegetarian choices. 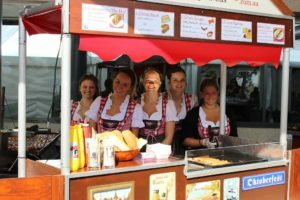 Other catering options include Schnitzels, pretzels, apple strudels and crumbles and Australia`s best breads for Gourmet sandwiches, breakfasts and other special occasions. Our catering always comes with great looking food service stations, e.g. our awesome Hot Dog food truck as well as several Hot Dog carts and Hot Dog stands that can cater for both indoor (e.g. office catering) and outdoor locations. We are fully licensed and offer mobile bar services with imported German beers (such as Weihenstephan, Franziskaner, Paulaner, Löwenbräu or Lowenbrau, Hacker – Pschorr, Stiegl and Spaten Munich) and local craft beers (such as Young Henrys, Batch brewing company, Hairyman brewing company, Shark Island brewing company and others) both bottled and on tap. We also offer delicious mulled wine and of course a range of wines and spirits from Germany and around the world. We also offer a “mobile beer garden” service where we set up an authentic German style beer garden on your site.